MobCraft turns ideas into beer. Submit your idea, vote on what’s next. 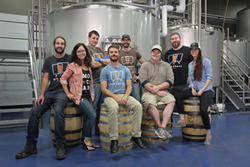 MobCraft Beer is a crowd-sourced brewery – each month they leverage the power of the crowd to generate ideas for unique craft beers. Beer fans across the U.S. submit ideas ranging from a couple of flavors to tried and true home-brew recipes. The ideas go up for a vote each month on our website. Votes are cast by placing a pre-order for the beer you would like to see brewed. The beer with the most pre-orders wins and is brewed, packaged, and shipped straight to your door through an online retailer or made available for pickup at the brewery. We have taken the fan favorites and brought them back as flagships which can be found at your favorite bars, liquor stores and or grocery stores throughout Wisconsin and beyond. If you find yourself in Milwaukee, stop by our taproom where we offer our flagships, crowdsourced beers, beers from our Wild & Sour Program, as well as a variety of taproom only releases. The spacious taproom boasts views of our brewhouse and wild & sour room, as well as foosball, ping pong, live music, outdoor seating and much more! Listen to a Food Finance Institute podcast with Henry Schwartz, co-founder of MobCraft Beer, about creating a successful business.